The calendar will be on its way to you on Friday. The rest of you who requested bookmarks will be receiving an email from me shortly so I can get your mailing addresses. Now, onto something important, and related to Thanksgiving. Like many of you, I have a great life — a very nice roof over my head, wet food for every meal (with no meat by-products! ), treats and lots of toys. Even if I do have to endure unwanted kisses on a daily basis, it’s still a pretty good deal. That is why I regularly try to give back to kitties who are less fortunate than myself. That’s why I have chosen to donate a dollar for every one of my 2011 wall calendars purchased to Rikki’s Refuge, and why I have the widget in my sidebar for those of you who would like to donate directly to them yourselves. That widget is only going to be up for a few more days! 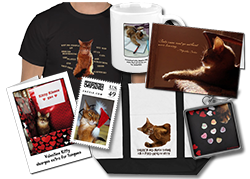 In December, I will pick a new rescue for the sidebar widget, and a new pledge (although I will still be donating calendar money to Rikki’s Refuge — that is ongoing until I stop selling the 2011 calendars). Here is where you come in: I want you to pick the group for my December pledge! I asked my Facebook fans for suggestions, and now you can vote on them in the poll to your right. You have until November 30, and you can pick two, in case you have a hard time deciding, although there will only be one winner. The rescue with the most votes will get a donation widget on my blog, and I will donate a dollar from each Dear Sparkle book sold on Amazon during the month of December! I know a lot of you already have one or both of my books, but keep in mind that they do make nice gifts and stocking stuffers! Blind Cat Rescue: I have written about this North Carolina rescue and sanctuary before. They formed to create a safe place for supposedly unadoptable blind cats who would otherwise be euthanized in shelters. Now they are saving up to build s second building to house FIV/FeLV cats. Cat Angel Network: This Pennsylvania-based rescue organization focuses on adoption and educating the public about the proper cat care and the importance of spaying and neutering. Kitten Associates: I nominated this one myself, because even though it is a new organization, Robin, the woman running it, has been doing amazing things! 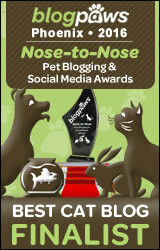 (You can read about some of her work in her award-wining Covered In Cat Hair blog.) Located in Connecticut, Kitten Associates not only rescues cats from high-kill animal control facilities in Georgia, it is also working to help make life better and adoption more likely for the cats in this part of the U.S. Some of the Kitten Associates kittens being fostered in GA are very sick right now and incurring a lot of vet costs. Cat Adoption Team: This large, sophisticated cat shelter is located in Oregon and cares for between 400 and 600 cats on a daily basis. From 1998 through December 2009, they have adopted out nearly 22,000 cats! PurrEver Ranch: A Tennessee-based sanctuary and hospice for elder, abused and less-adoptable cats, this organization makes sure that their seniors have a home for life, saves death row cats, and feeds feral colonies. This group is a favorite amongst my Facebook fans. They are losing their home and really need money to relocate right now. Lauren’s Zoo Special Interest Adoptions: They rescue, care for and adopt out all species, specializing in special needs animals that often need extra medical care. They have placed pets all over the southeast US and are located in Alabama. Please vote on the rescue that you think should be the recipient of my December donation pledge — voting is open only until midnight, Pacific Time, November 30! Rita at PurrEver gets my vote! Not only is she a wonderful kitty mom/rescuer/caregiver, but she’s an advocate for other rescuers in need. In a time of tragedy, Rita asked her donors to give to our rescue instead of hers and she gathered needed supplies and delivered them. Without knowing any of us, she did all this. She has been one of the best new friends anyone could ask for. She gets my vote every time! Thank you, Sparkle! It was so nice of you. And what wonderful groups to support. We hope yoo all had a wonderful Thanksgiving. Happy Thanksgiving Day to you and yours! Happy Thanksgiving, Sparkle! Those are all such great groups … choosing is going to be really tough!!! Happy Thanksgiving! We’re so thankful for great furiends like you!! Happy Thanksgiving to you and your family Sparkle! Congratulations to Anne for winning your calendar! We voted although it was a tough choice since they all deserve to win. We picked the one here in Oregon though. Happy Fanksgiving Sparkle! I hope you have a wonderful day with some real live fresh dead turkey at the end of it! Sharing is wonderful – thank you! Happy Thanksgiving to you from all of us! Happy Thanksgiving! We are thankful for great friends like you! Sparkle you are very generous. We know that whomever you choose to help will appreciate it very much. We voted! YEAH!!! Happy Thanksgiving!!! You are a very good cat Sparkle. I had to vote for Cat Adoption Team because they are close to where I live and they do such good work. We see their kitties up for adoption at the local Petsmart locations. We wish all the shelters could win. Happy Thanksgiving to all of you!! You are a thoughtful cat! Thank you for including us in the voting for your next charity. We voted for Blind Cat Rescue…since I volunteer for blind and visually impaired humans, my boys though it fitting that they vote to help blind kitties. Sparkle – you are so very wonderful to donate to the shelters. Happy Thanksgiving dear friend. Congrats to Anne on winning the calendar!! Those are all worthwhile groups, Sparkle! It’s gonna be hard to choose! We love the Purrever Ranch what a wonderful place – I have voted too. Hooray for Annie! And a note to Marg, Purrever Ranch is really wonderful! I voted Sparkle! Happy Thanksgiving everyone! Sparkle that is such a great thing to do. I checked out the Purrever Ranch. That looks like a super shelter. I need to figure out a way I can help them in some way. Thanks for doing all this for the homeless animals. Happy Thanksgiving. I hope all the charities win. Sparkle, you are wonderful to donate so much to charities. We, like you, have a very good life and feel so sorry for all those thousands of kitties (and doggies) who don’t have it so good.